13 Welcome to the school! Wiki public editing information: username "vvv12" and password "s*str*" with the first star replaced with "e" and the last star replaced with "i". Farewell dinner at Polpo Mario in Sestri Levante, at 8pm. Directions: here!. Important: we are still missing people for tomorrow's dinner, please register before 10.30. The end of the school is approaching try to plan a demonstration for Friday. Try to be on time for dinner tonight because there will be music again. Sally Ride, the first American woman in space (and second woman overall, to Valentina Tereshkova of the USSR) has died of pancreatic cancer at the age of 61. 11:45 - Tutorial: cartesian & gaze interfaces (finally :) slides+code. ...or play Starcraft? See VVV11_Starcraft ==> What about playing League Of Legends for a change ? We can create a VVV ranked team :) About Starcraft we need the ISO, Kathrin ? News for groups: on Monday morning there will be a "group update" session. We invite everyone/each group to give a short presentation on what is planning to do during the remaining days of the school. School closes after lunch. Given today's weather you are welcome to stay. Concert at the summer school venue! Free entrance for the students. 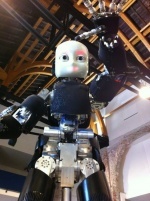 10:00 - 10:30 black or white iCub. 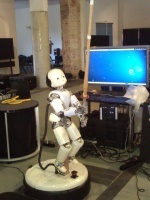 emoBot is playing a little bit with the robot. 15:00 - VVV12/EFAA group internal update meeting. VVV12/EFAA Working group related to the EFAA european project. This page was last edited on 3 September 2012, at 06:39.